A monthly budget checklist is going to show how much money one has at the end of the month. It helps provide one’s debt to income ratio.. One would need to know the exact amount or an average amount that they pay out on each bill each month. This way the monthly budget checklist will be as accurate as possible. The template that is available is easy to use and can be downloaded for free. All you need to do is download it right here and you can customize it to fit your needs. A monthly budget checklist is a great way to stay on top of your bills and know what you have going out every month. Some people will use the monthly budget checklist in order to help them figure out which bills they can cut out in order to save more money. 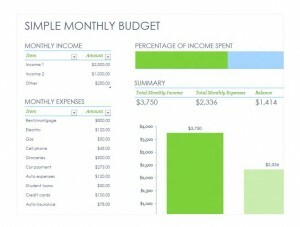 Other individuals use the monthly budget checklist template for business use as well as personal. First, you need to put in every one in the home’s monthly income. You can itemize that by income 1, income 2, and other, as an example. Next, you will need to make a list of every type of bill that you have. For example, this could be rent, gas, electric, credit cards, internet, and any other bills. Then you will need to put the exact or average amount that you pay beside those items. The Excel spreadsheet is going to do all the math for you. There is a summary section that is going to add up all your income that you bring in, figure the total that you pay out, and it will subtract the two categories to give you the balance you will have over at the end of the month. The spreadsheet will also put this information into a chart form to give you a better visual of the difference. Be sure to download the free monthly budget checklist today.